While ’tisn’t the season yet, ABC has renewed The Great Christmas Light Fight TV show for a sixth season. Carter Oosterhouse and Taniya Nayak judged season five. 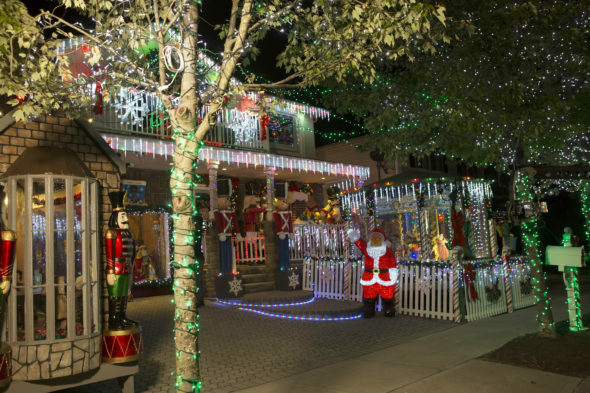 An ABC competitive reality TV series, on The Great Christmas Light Fight judges assess the creativity and decorating skills of everyday people who take holiday decorating to the next level. In the end, the winners are awarded a cash prize, as well as the coveted “Light Fight” trophy. The fifth season of The Great Christmas Light Fight averaged a 0.94 rating in the 18-49 demographic and 4.58 million viewers. Compared to season four, it was down by 13% in the demo and down by 6% in viewers. Find out how The Great Christmas Light Fight stacks up against other ABC TV shows. ABC has announced season six of The Great Christmas Light Fight will debut this December. Meanwhile, season seven is already casting. What do you think? Are you a fan of The Great Christmas Light Fight TV series? Do you think you’ll check out season six on ABC? I love this show. Every year they just outdo the last year. Glad it is back for season six and seven. Like it, will watch this season.